But there are other reasons to choose to avoid caffeine than the misconception that it’s bad for you. Some people react badly to it; they become jittery, get headaches, some people even experience vertigo. Other Canadians don’t appreciate the social and environmental baggage attached to coffee consumption. So what are some caffeine-free alternatives that you can use to get you started in the morning? Tea is a great option for Canadians who want a hot start to their morning. While traditional teas such as black or green do have caffeine, many herbal and fruit teas do not. Teas are available in organic and conventional growing options, hundreds of different flavours, and can be quite affordable. Just remember to keep the milk and sugar to a minimum! Fresh Juice is loaded with sugar, but it also comes with a lot of great vitamins. Instead of drinking store bought juice, we’d recommend just eating the apple or orange. If you have a juicer at home that leaves all that great fiber in, then feel free to enjoy liquefying your fruit before consuming! Green Smoothies are often a combination of fruits and veggies. They have a lot of great vitamins and fiber, so they can be just the boost you need if you aren’t a breakfast person. The internet is full of a wonderful recipes you can try. For a stronger, sweeter taste use tangy fruits like citrus or berries with duller tasting veggies like lettuce. If you want to embrace the green, pick up some kale or swiss chard! Water is the best thing to drink. Most of us wake up dehydrated after a whole night asleep, and a cup of water (hot or cold!) rejuvenates the body and gets us ready to take on the world! For a splash of flavour, add a little lemon juice and a mint leaf! Be sure to actually consume some calories alongside the H2O though. Some fruit, a little bread, and some cheese can be just what your body needs to carry you through until lunch. 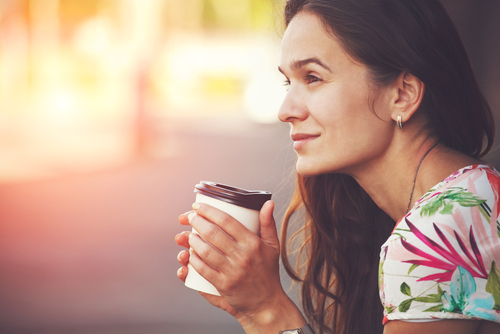 Coffee isn’t bad for you, but that doesn’t mean there aren’t great alternatives available. At Health Risk we’re all about helping our clients make the best decisions for their health. Generally, that means keeping on top of the research and suggesting balance and consumption in moderation. If you have any questions about how Health Risk can help you live a healthier, happier life, contact us today!